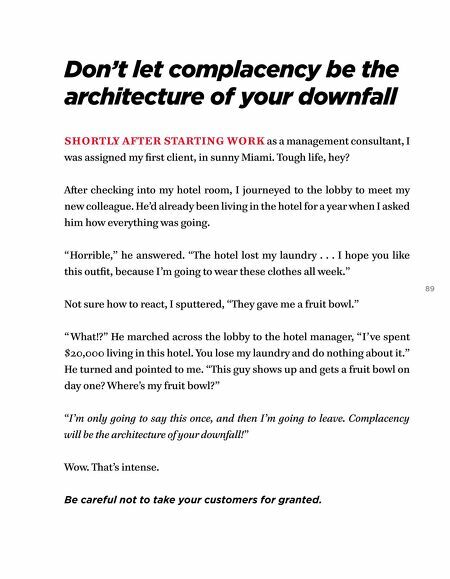 Don't let complacency be the architecture of your downfall SHORTLY AFTER STARTING WORK as a management consultant, I was assigned my first client, in sunny Miami. Tough life, hey? Aſter checking into my hotel room, I journeyed to the lobby to meet my new colleague. He'd already been living in the hotel for a year when I asked him how everything was going. "Horrible," he answered. "The hotel lost my laundry . . . I hope you like this outfit, because I'm going to wear these clothes all week." 89 Not sure how to react, I sputtered, "They gave me a fruit bowl." "What!?" He marched across the lobby to the hotel manager, "I've spent $20,000 living in this hotel. You lose my laundry and do nothing about it." He turned and pointed to me. "This guy shows up and gets a fruit bowl on day one? Where's my fruit bowl? " "I'm only going to say this once, and then I'm going to leave. 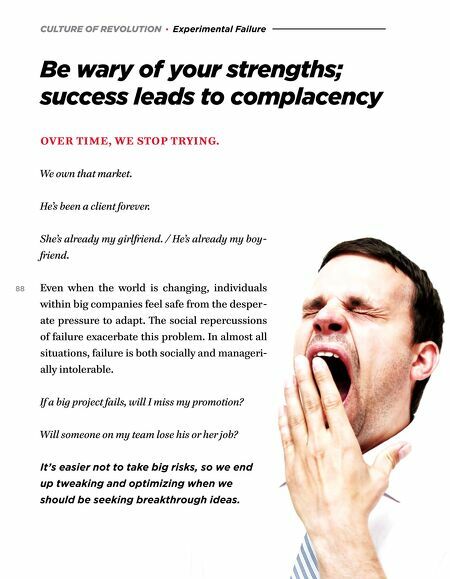 Complacency will be the architecture of your downfall!" Wow. That's intense. Be careful not to take your customers for granted.